Motivation & productivity is what helps drive your business. You can be given the best strategy or steps, but you have to be consistent with that strategy and show up day to day. Productivity is what allows you to bring all your brilliant entrepreneurial ideas to light. Here are few things to help you out when building productivity into your daily routine. You are not going to be your most productive self 24/7. Ride the waves of being productive and give yourself breaks when you just can’t get in the groove. 2. Time is set, you will never gain more than 24 hours in a day & you will not be it’s master. 3. A bad day should not equal a bad tomorrow. Reset before bed. Figure out what happened. How can you reset tomorrow? 4. It’s a journey not a destination. There will be always be more to do, you will never conquer your to-do list when it comes to your business. If you don’t have anything to do, you don’t have a business. Things will be harder in the beginning and less hard as you learn, but it’s never done. 5. Focus does not equal productivity. Sitting out the screen forcing yourself to write, but not writing will get you no where. Focused action is the key, if you absolutely can’t force your brain into doing that task, move on. An hour spent focused is wasted if it’s not an actionable hour. Your time is better spent taking a break or finding something you can focus on. This is not an open invite to do whatever everyday, it’s about recognizing when you need to switch tasks. 6. There is no formula. What works for someone else may not work for you, one size does not fit all. However, that does not mean you can’t figure out your formula. Which takes us to #7. 7. Experiment to find your “formula”. Find what works for you. You will have to make an effort to develop routines and habits that will support your productivity. Read this post on how to get started, I also highly encourage you to try out the Pomodoro technique. 8. Even YOUR formula will change. What might work best when you begin your business, may not work best for you in 6 months time. Also different tasks may require different techniques. Even the change of season can affect when you are most productive and your schedule may need to be adjusted. Find ways to make tasks easier, technology does a lot these days. Don’t be afraid to investigate and try to make technology work for you. I got your social media covered with this post. 10. Fear is usually the root of most of our lack of productivity. Often times our minds can play tricks on us. The closer we get to something we feel uncomfortable with or that we are afraid (even if that fear is irrational), we can self-sabotage. This can show as lack of motivation or progress it can also show up as #11. Working on mindset is part of this process. Often times lack of discipline can be a way of self-sabotaging or because we are pushing ourselves too hard. However, you want to develop a structure to avoid this pitfall to productivity. This can be avoided by sticking to a schedule, setting deadlines, and avoiding distractions (hello Netflix). 12. Be honest with yourself and re-evaluating. Staying productivity is something that you have to keep working at. You may be highly productive for a while and then realize you have slacked off a bit on the discipline or you need to re-evaluate what you are spending your time on or how you are approaching tasks. Like most things in business it’s a process and something you have to keep working at. I hope these tips help you as you work on becoming more productive. Working on productivity, routines, and keeping motivated will help grow and bloom your business, and make the hustle a hell of a lot easier ;). 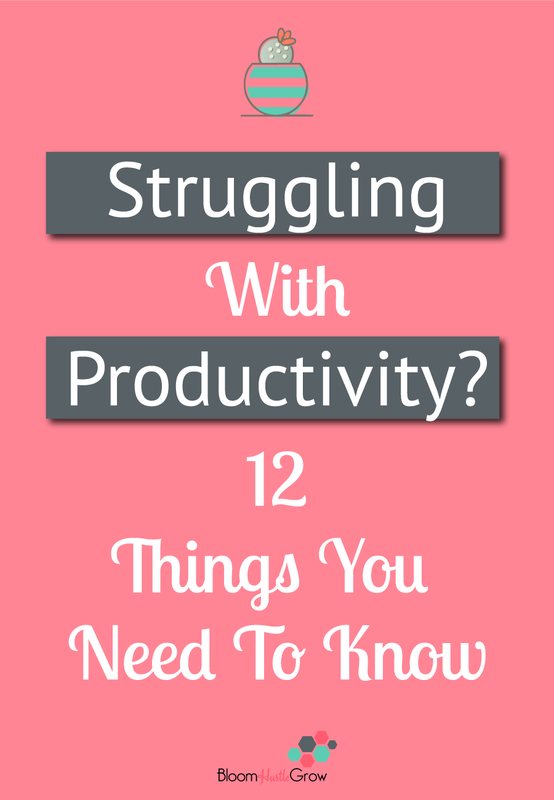 Take this quiz to help sort it out your main productivity struggles! Discover the identity of your productivity nemesis and get the secret weapons you need to fight back.